My neighbor was doing some gluten free experimenting last week and she sent over some really yummy food to try. This was the roasted asparagus recipe, and she also sent along little polenta pizzas and a banana yogurt dessert (recipes coming soon!). Everything was worth posting about! 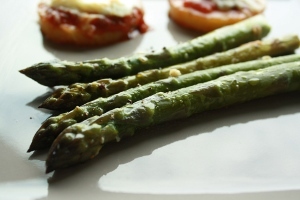 On a large rimmed baking sheet, toss asparagus with oil and garlic; season with salt and pepper. Roast until tender and browned in spots, 15 to 18 minutes. Serve warm or at room temperature.